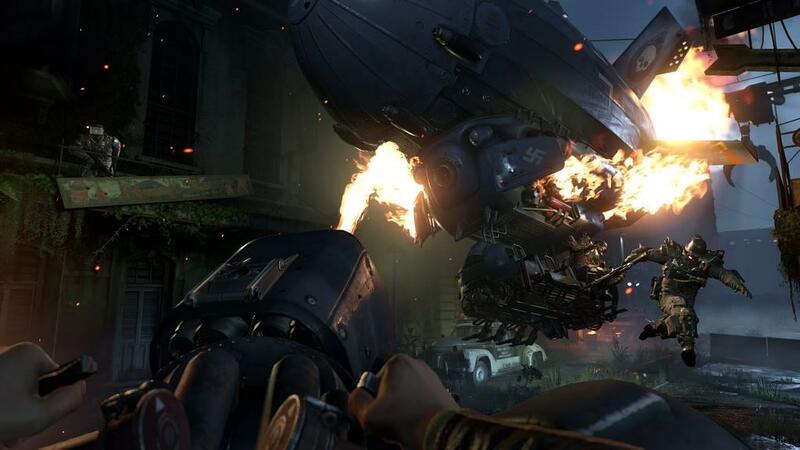 Wolfenstein II: The New Colossus, is the latest in the first-person shooter series that started it all. It’s got pace. It’s got action. It’s got guns and bullets and the fire and the flames. It’s got emotion, performance, and writing to back it up. Needless to say: it’s muy bueno. Starting in the immediate aftermath of The New Order, players are treated to a cutscene recapping all the events that happened in that game. And then? It’s Nazi-killing time in the homeland. 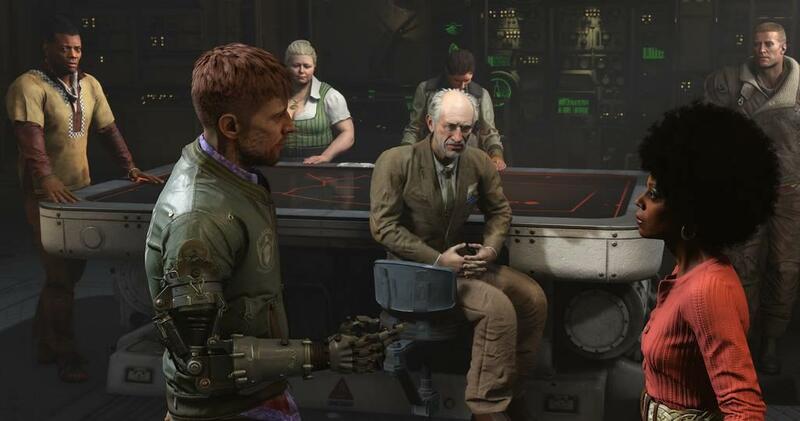 *Record scratches* The thing about Wolfenstein II, though, is that it’s not just about going from mission to mission, killing enemies. No, this is not that type of mindless shooter. In addition to going from mission to mission, plot point to plot point, this is a character-driven game. Rather than our hero, William Joseph Blaskowicz, being a hollow, unfeeling vanquisher of evil, we have a man who is emotionally scarred from the traumas of his life, and therefore has a reason to keep fighting. Narrating throughout with a voice that sounds like it came out of a Tillie Olsen novel, our man blasts through wave after wave of enemies, splattering the walls, his weapon, and his body, all while wondering what his existence means to himself, and to his friends. It is these quiet moments, coming during the breaks in the violence, that color the game with its real charm. For the amount of time I spent with this game, I can still remember all the interactions I had with the characters, scripted or otherwise. From Grace of the Black Revolutionary Front or her husband Super Spesh, to Max Hass and Bombate, to the sinister Frau Engel, I can recall each of their distinct personalities as if I had spoken with them in real life. The writing here is as humorous as it is serious. From idle Nazi soldiers talking about what they’ll say before they kill someone, or chatter on the captured U-Boat, Eva’s Hammer (my favorite is when a European partisan drops the book she’s reading all the way down to the bottom, to which someone asks: “Did you just drop your book?” and she responds: “No”). But of course, the writing and sweet character moments that define whether or not a player will connect emotionally with the people onscreen are not necessarily what will hook them, right? No, the real kicker is: how does it feel killing all those Nazis? The answer is damn good. The fluidity of movement, the impact the bullets, lasers, flames, and shells have on foes both robotic and not, add an immense satisfaction to the physicality of the game. The influence of the recent Doom reboot is strong here, but subtle enough to let the game stand on its own two feet. I played on the difficulty “Bring it On!”, described as being tuned for players experienced with shooters. It gave me a variety of playthroughs. While not as invincible as the Doom Marine, I shot my way through dozens of Nazi strongholds, taking damage where it was logical to take it (Blaskowicz is the ultimate war machine, but he’s no Captain America), sometimes barely making it out of the scraps. This is a challenging game, and the enemies are unforgiving if the player makes a mistake (case in point, while on an assassination mission, I fell from the rafters and was cornered by three heavies, armed with everything from flamethrowers to rocket launchers, I died). With that said, although this is a very straightforward shooter (you see something? Kill it), that’s not to say that some critical thinking isn’t warranted. There are environmental constraints in certain levels that will affect BJ’s health, there are moments when nearly endless waves of enemies will spawn if he is spotted. My favorite moments in the game are actually the ones that Wolfenstein is not necessarily known for: stealth. Granted, this opportunity only comes up once in a while, and it is not perfect. The enemies spot BJ in an instant, and if the player is in a situation where an endless spawn is possible, well, there goes the approach. It can feel like the game wants the player to consistently go all out with the huge firefights and explosions, but why would it do it this way, when I can equip silencers on my weapons? It is extremely frustrating when the environments are so equipped for stealth playthroughs, but the AI is not. It is an area that can be just as intense, if not more so, than the usual run-and-gun, and the pacing does not suffer one bit, but given that the game practically punishes its players for behaving in a way that is not typical of its style, it is a disappointment. 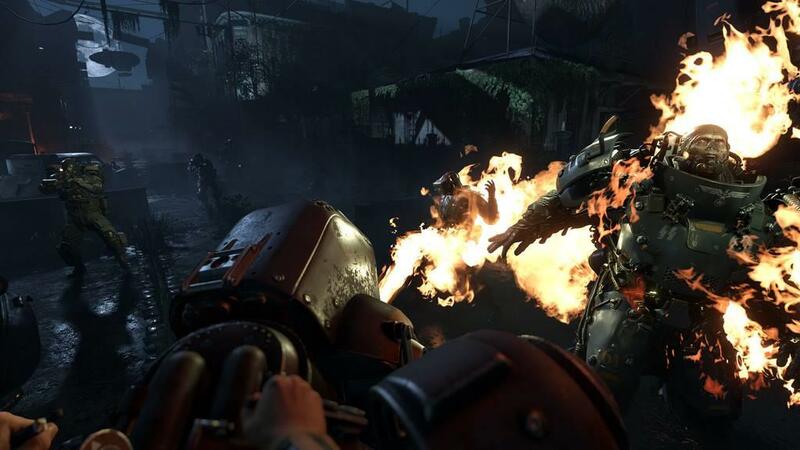 What isn’t a disappointment, though, is the world of Wolfenstein II. This is no longer a WWII shooter, but a 60s socio-scifi shooter. From the irradiated wastelands of New York, to the walled-in New Orleans. From the complicity of white Americans and the natural evolution of leftist black political evolution (the Black Revolutionary Front being akin to the Black Panthers), this plays like a fantasy version of Man in the High Castle. It continues the themes of the first game, while expanding on how similar the game’s world and our world seem. And that brings up the negatives of the game. Thankfully, there aren’t many. Besides the aforementioned restriction on the style of gameplay, the game’s direction can be almost aimless. That’s not to say that the traditional method of figuring out the route for yourself routine got one over on me during my time, but instead, it was a mixture of that, and hidden passages that lea to the next stage. This navigational didn’t mesh as well as it should have. It slows the pacing of the game, and what once was immense, chaotic fun is turned into frustrating backtracking all over the mission map just to find where to go next. My other gripe is not of huge significance, but is disappointing nonetheless. It is a lack of a mission select screen. Now, there could be some convoluted way of getting it that I haven’t found yet, by way of selecting something on the world map and replaying a mission, but even if that were the case, it’s still too convoluted for me to figure out. It was present in the first, so I don’t understand why it’s not present in the second, unless it has to do with the plentiful endgame content, which I won’t spoil here. I can see that as a replacement for replaying the missions, but those missions were fun and packed with content, so it’s unfortunate that I can’t play it again. 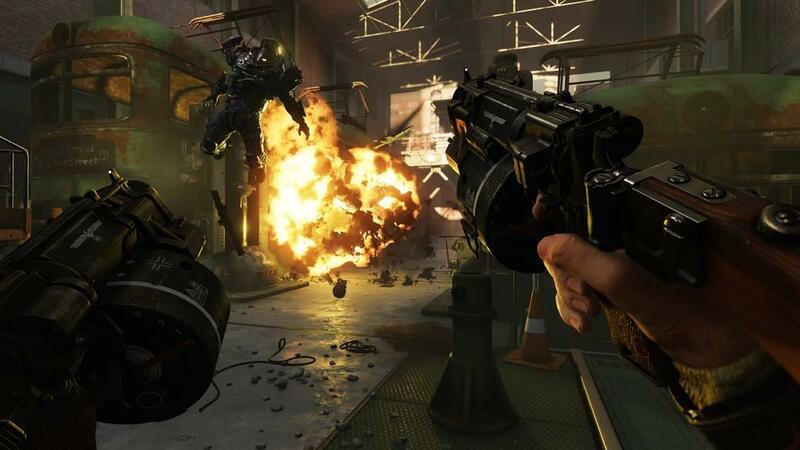 Wolfenstein II is a powerhouse. A return to form of the old shooters, combining just enough characterization, snappy writing, and emotional punch to make it fresh and new. It is not a title to miss.